The recent sailing of the Legendary Rhythm & Blues Cruise brought an outpouring of goodwill, fundraising support, and free music to San Juan, Puerto Rico, the B.V.I. of Tortola and Grand Turk, Turks and Caicos. The Blues Cruise (LRBC) embarked on its 30th full ship charter from February 4-11, 2018 with over 25 music groups onboard to entertain Blues music enthusiasts in all venues of the ship for the duration of the 7-day Caribbean cruise. Despite the severe hurricane devastation of September 2017, LRBC CEO Roger Naber elected not to abandon the original itinerary agreed upon in 2016. Rather, he brought the sold out charter cruise on the Ms Koningsdam with 2,500 passengers and 1,100 Holland America Line crew to the Islands in need of hurricane relief and tourism dollars. 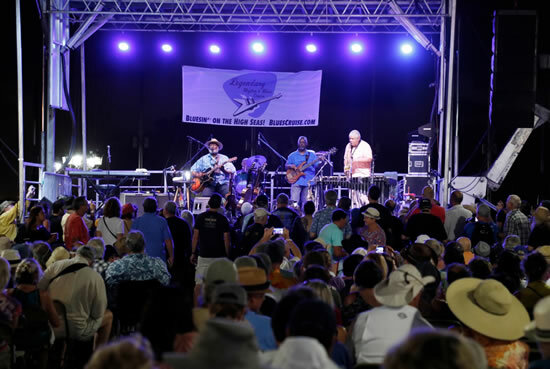 While the ms Koningsdam was in port, LRBC worked in conjunction with local tourism departments to produce free shoreside music events featuring popular blues bands, inviting locals and cruise ship guests alike to attend. Upon arrival to the British Virgin Island of Tortola, the LRBC was met by island co-organizers, the Tortola Rotary Club, local port agency Romasco Group and Worldwide Cruise Associates who all came together to organize an unforgettable event. LRBC provided the music featuring the Legendary Ils Sont Partis Zydeco Band and the Deanna Bogart Band performing in the Pier Park. In preparation for the event, LRBC cruise guest Jon Gale of White Rock, British Columbia began fundraising with his local Rotary Club and his efforts amounted to a donation of $18,500 with an additional $5,000 contributed by LRBC cruisers onsite during the 3 hour music event. 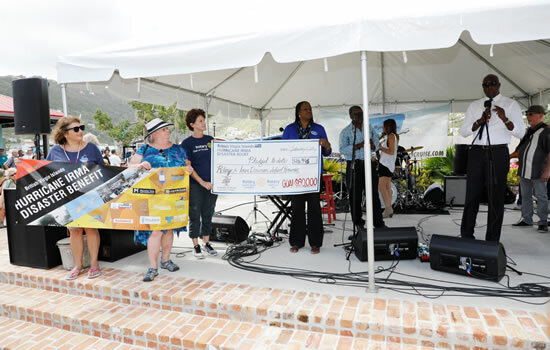 To date, there has been a total of $40,000 raised through efforts of the Rotary Clubs and the Legendary Rhythm & Blues Cruise music fans to rebuild the school and community center in Tortola’s Cane Garden Bay. Fundraising efforts continue with the Rotary Club through a grant matching program sponsored by the Canadian Government for the popular tourist island that sustained severe damage over 90% of the island as a result of the 2017 hurricanes. The highlight of the cruise was LRBC’s large-scale land event held while the ms Koningsdam was docked in Old San Juan, Puerto Rico. 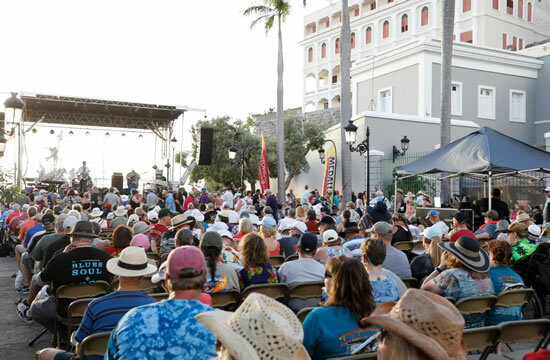 The Puerto Rico Department of Tourism assisted in securing the ideal location in Old San Juan for the event while LRBC provided featured artists such as 2018 Grammy Award winner Taj Mahal, Tab Benoit and Commander Cody along with the San Juan salsa jazz band Jerry Medina. The production of this event supported local businesses and service providers which included Caribbean Audio for a mobile stage, sound, lighting and musical equipment, as well as services needed for the expected attendance of over one thousand music fans. The goodwill has continued after the conclusion of the cruise with Legendary Rhythm & Blues Cruise donating directly to further support Caribbean hurricane relief causes. LRBC donated $9,638 to the Second Harvest Food Bank of Puerto Rico, a non-profit organization providing meals to citizens who were the hardest hit by the hurricanes, some still without power after six months. In addition, The Holland America Foundation received $10,000 from LRBC and in conjunction with the Micky and Madeleine Arison Family Foundation will match the LRBC donation, generating $20,000 to support relief and rebuilding efforts for those most affected by the recent hurricanes in the Caribbean. 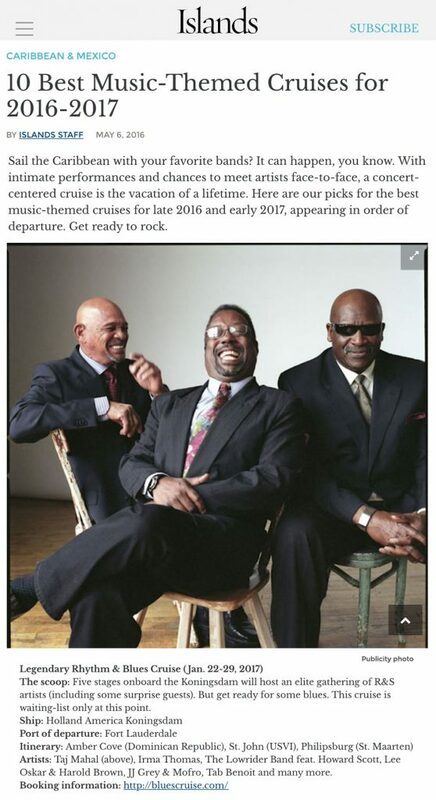 The granddaddy of cruises on this list, Blues Cruise was founded in 2002, and sells out both of its twice annual sailings well in advance. In fact, its upcoming sailings are already wait-listing people. Why is this such a hot ticket? In part due to the jam sessions and artist workshops that make it much more interactive than the typical concert setting. A lot of blues fans are also amateur musicians — and the opportunity for them to pick up an instrument and jam alongside their idols makes this the highlight of a lifetime.